This entry was posted in Web links on January 29, 2005 by Links. This entry was posted in Interesting on January 28, 2005 by Mark. I was at a gas station last night filling up my inefficent beast and saw this. I was amused. 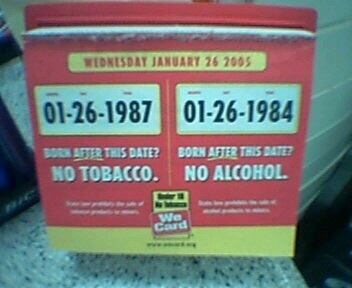 Now you don’t even have to figure out if you are 18 or 21 anymore. Just look at this calendar! This entry was posted in Phone post on January 26, 2005 by Mark. 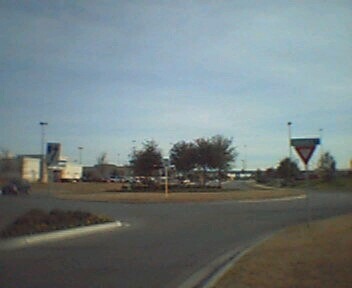 Round Rock has a Roundabout intersection. As far as I know, it is the only one of its kind in the city. Some people would have you believe that roundabouts are better than sliced bread, but this is only marketing B. S.. What about my personal experiences? If no one is around, I love it. You don’t have to stop like you would at a stop sign and I don’t mind driving 270 degrees around the circle to do a left turn. However, it is a problem when other people are around. Most people seem to not know how to drive in one. They do not realize that they have the right of way when inside the roundabout and the traffic waiting to enter the roundabout must yield to them and that it is a one-way only road. Take a look at the picture. The sign on the left tells you which direction to go (counter-clockwise) and the sign on the right tells you that you must yield to other cars. Simple, right? No! They always seem to get this wrong and treat each exit of the roundabout as a stop sign. I don’t mind this much. Eventually, people figure out that traffic is waiting for them to clear the roundabout and they move on. Today, I experienced the worst thing about unexperienced drivers. And that is people trying to make a left turn in the roundabout. As I was aproaching the roundabout, I saw someone perform a left turn by driving in the wrong direction (clockwise — what seems quick and short to them). I didn’t think anything about it. I entered the roundabout to do a right turn. As I was inside the roundabout, someone traveling in the opposite direction pulled in front of me to do another illegal left hand turn. The road only has room for one car and that car was now blocking me. I probably could have handled it more politely, but I honked my horn to indicate that they should stop driving because we are about to collide and gestured that they were going in the wrong direction. Fortunately, they backed up and turned right to allow me to clear. So my question is, shouldn’t Round Rock as a city educate people before they install something new that involves minimally trained, clueless morons driving in steel-boxed death-traps? This entry was posted in Phone post on January 23, 2005 by Mark. need to do is to ssh into it. Unfortunately, it was not that easy. This entry was posted in Programming on January 23, 2005 by Mark. This entry was posted in Web links on January 21, 2005 by Links. Wow, I have done 12 Sametime chat sessions this week. Actually, now that I think about it, it was 14. I closed 2 of the sessions. But wait, there is more. Another person just sametimed me! Gah! This is getting too cluttered! This entry was posted in Interesting on January 21, 2005 by Mark. Ahhh, I should visit there someday. Today, it was the deciding factor in Paris Paris. I went from a tie for first with Ed to a solo victory! Woo Woo! This entry was posted in Gaming on January 19, 2005 by Mark. 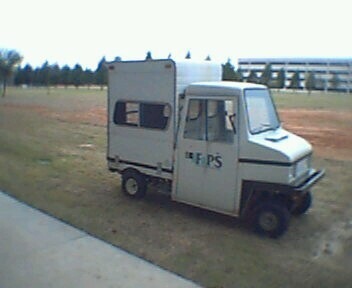 This entry was posted in Phone post on January 19, 2005 by Mark.